Do you market a local business on Facebook? Have you heard about the Facebook Local app? 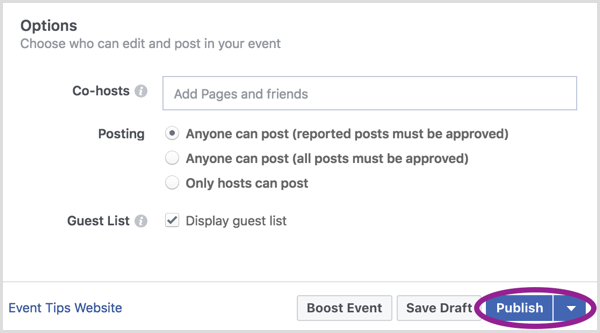 In this article, you’ll discover how to use Facebook Local to create events that drive in-store foot traffic. 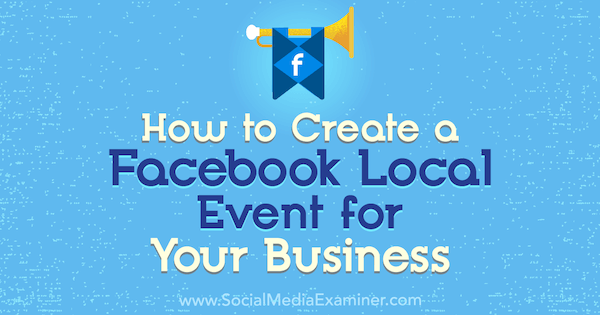 How to Create a Facebook Local Event for Your Business by Taylor Hulyksmith on Social Media Examiner. What Is the Facebook Local App? 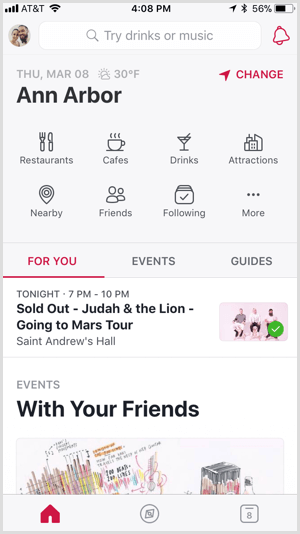 Facebook Local (iOS and Android) was previously the stand-alone Events app before Facebook rebranded it to compete with business discovery and engagement tools like Yelp and Foursquare. But while the other platforms tend to function as passive research tools, Facebook Local melds local business communication, in-person events, and scheduling into one happy mobile package. While it’s not yet the most intuitive user interface ever created, the user customization in each area makes it easy to become entranced by whichever event, page, or place is displayed in front of you. Facebook Local is an extension of Facebook. Although you access the two environments via different apps, your user identity remains constant. You access both using the same login and profile, and maintain the same connections with friends, businesses, and events. Each app is built for a different user experience with unique functionalities all its own. However, certain types of activities can occur interchangeably between platforms such as event discovery, reviewing, and liking a page. 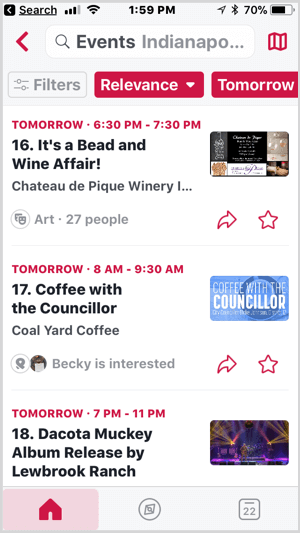 When you open the app, you see three icons at the bottom of the screen that help you prioritize, discover, and schedule events and local businesses near you. For You displays a summary of upcoming events on your schedule, events your friends have their eyes on, and a peek at upcoming events in your area. Events shows a lot of the same information you’d find on the For You tab, but organizes the events in chronological order. It also encourages you to map out your own personal schedule. Guides functions as an event discovery tool, where you can browse local events by interest (e.g., food & drink, arts & culture, etc.). If you tap on any event, you see everything you would if you had clicked on an event within Facebook: the name of the event, which business or group is hosting, when and where the event is happening, who’s interested, who’s going, event details, a discussion thread, and more upcoming events at the venue. The Search tab looks a lot like Yelp. You can search for different events and businesses by category or offering (e.g., shopping or drinks, etc.). Here, your search results populate as pins on a map. Tap on a business, and you’ll see a snapshot of the Facebook business page (or place): name, address, hours, phone number, star rating, type of business, customer tips, a link to the business’s Facebook page and website, business photos, and reviews. The Calendar tab is very straightforward. Browse all of the events you’ve indicated you’re attending, are interested in, or have been invited to. Now that you know what you’re working with, let’s get into how you can leverage this new local leader to create more activity on your Facebook business page and subsequently drive more in-store traffic. 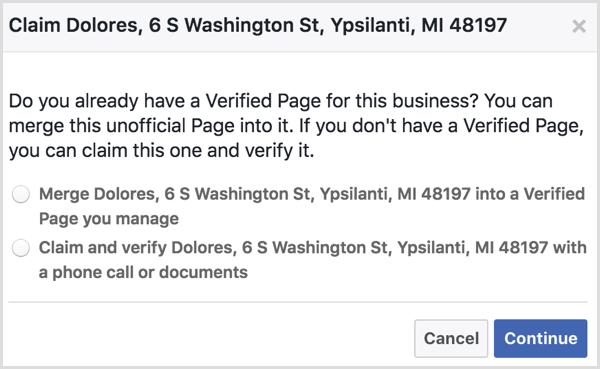 Before you can take Facebook Local by the horns, first make sure you have created, claimed, and/or merged your official Facebook business page with your unofficial Facebook place page. You need to make sure you’re operating a united front to avoid customer confusion. To find out if a Facebook place page exists for your business, use the Facebook search function. A place page is created when the first user checks into your business. If an official business page doesn’t exist, Facebook interprets the check-in as a cue to create an independent, unofficial place page. 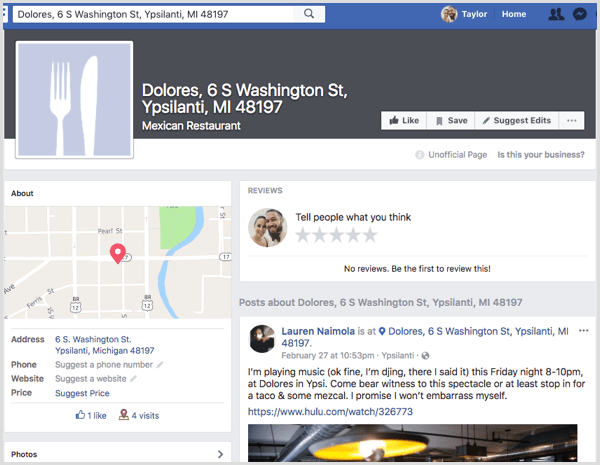 An unclaimed Facebook place page looks just like this for recently opened Mexican restaurant Dolores in Ypsilanti, Michigan. The purpose of a place page is to aggregate and centralize Facebook users’ experiences with a physical location. Although they’re created without notification or sign-off of the business owner, place pages create a community forum for customers to communicate, share opinions, and review businesses they’ve patronized. It all makes perfect sense at first; until, as the owner, you design, build, and publish an official Facebook business page, complete with accurate location and contact information, and a steady stream of strategic content that’s compliant with brand standards. To merge that pesky, unofficial place page with your official business page, Facebook offers a solution. At the top of your place page, click the Is This Your Business? button. Merge the place page with a business page you manage. Claim and verify the place to turn it into a business page. To merge with your official business page, select the first option and tap Continue. You’ll then be prompted to select your official page from a drop-down menu. If Facebook approves the request to merge the two pages, the place page’s check-ins and page likes will be combined with those of your official page; however, all posts, photos, reviews, and ratings will disappear. After this process is complete, you’re ready to move on to step #2 with full confidence that when a Facebook Local user is interacting with your business, they’re actually communicating with you. Considering Facebook Local’s origin as the Facebook Event app, creating and managing your business’s events gives you ample opportunities for prime app real estate. It’s a simple process to get your events live and your customers rolling in. 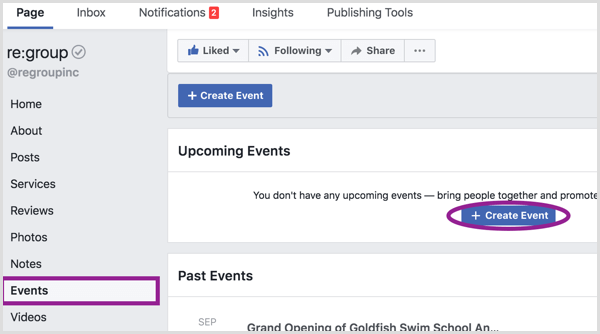 Go to your business page and then select Events from the menu on the left side of the screen on desktop (or from the horizontal menu at the top of the screen if you’re using the Facebook Pages Manager app). Click the Create Event button, and you’ll be greeted with a pop-up window asking you to fill out several different fields to classify and describe your event (who, what, when, and how). When you’re all set filling out the event info, you’re ready to get on the Facebook Local map. Just click Publish! 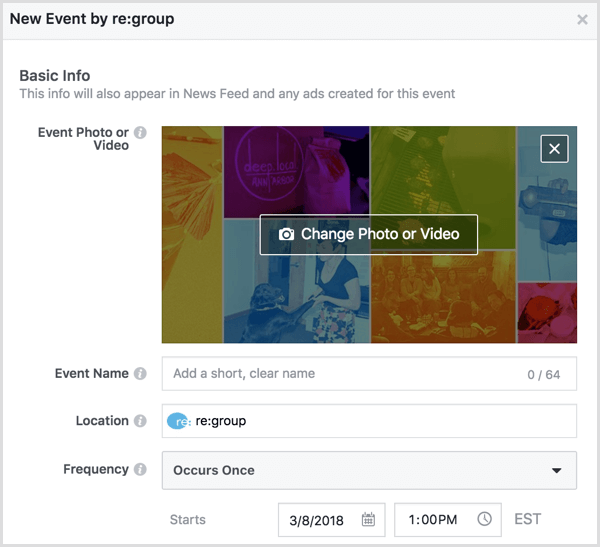 Now that your event is live on Facebook (and Facebook Local), and hosted by your official business page, it’s time to let people know about it and get them to respond! 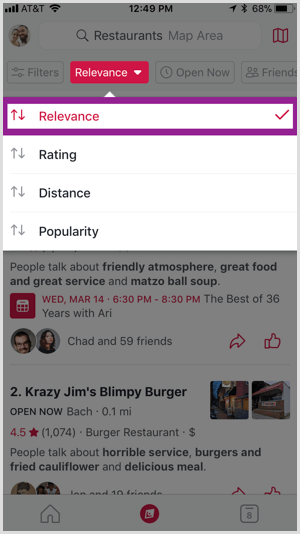 But first, let’s talk a little bit about how Facebook Local ranks event and page listings within the Home and Search sections of the app. The default ranking is created by something Facebook nebulously describes as “relevance,” which appears to be similar to (and about as crystal-clear) as the news feed algorithm. In short, snagging a good spot within the search results is a bit of a popularity contest. The more people like your page, the higher they rate you, and the more interest you generate for your event, the higher your event or business will pop up in the search rankings. Your business is probably the hippest, most exciting place to eat, shop, work out, or hang out, but as the business owner, your endorsement only goes so far. BrightLocal’s 2017 Local Consumer Review Survey found that 85% of consumers trust online reviews as much as personal recommendations. Think about the multiplier effect that viewing online reviews from personal connections could have! Add that to the fact that check-ins and reviews appear to boost the all-important relevance score on Facebook Local, and encouraging these activities is a no-brainer. This is especially true since 68% of consumers will leave a review when asked to do so. Display a window cling to let people know they can find you on Facebook. 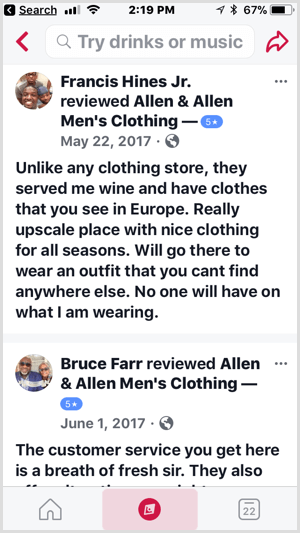 Add a prompt to leave a Facebook review at the bottom of purchase receipts. Send an email to your customer list requesting a review if they have any feedback they’d like to share. Host a contest that would incentivize customer check-ins with photos in exchange for a prize drawing. Use survey software like Listen360 to gather customer feedback that then prompts customers to leave a Facebook review. Showcase customer check-ins and reviews on an in-store monitor. That same study by BrightLocal found that 30% of consumers make a decision to patronize a business based on whether the company responds to the review. So obtaining reviews isn’t the end. Make sure you’re keeping an eye on your Facebook page, thanking your advocates, and listening to and respecting your detractors. Facebook Local opens up a whole new world of opportunity for business owners to attract, engage, and inspire customers to visit their business. If you follow the tips above, you’ll be well on your way to making a splash with your target audience on this brand-new app! What do you think? Have you downloaded the Facebook Local app? How do you use Facebook to drive foot traffic to your business? Please share your thoughts in the comments below. Taylor Hulyksmith is the social media director at re:group, an integrated marketing agency based in Ann Arbor, Michigan. She leads client content development, community and reputation management.